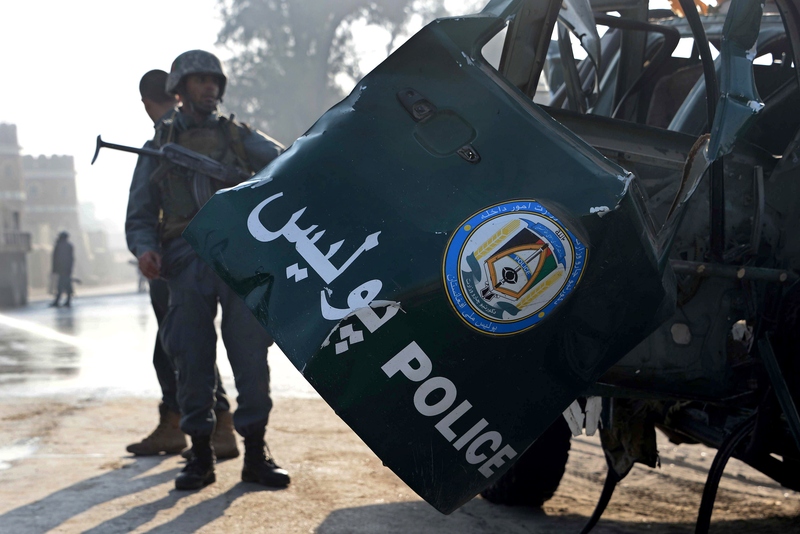 A man on a motorbike detonated a suicide bomb in Jalalabad, Afghanistan, killing 33 bystanders and injuring at least 125 more, local police reported early Saturday. Militant jihadist group ISIS has since claimed responsibility for the blast at Kabul Bank, which they say was aimed at taking out government workers collecting their paychecks. The bombing occurred at peak rush hour, when the terrorists knew traffic and impact would be heaviest, CNN reported. The ISIS offshoot responsible, Wilayat Khorasan, identified the bomber in a statement on Saturday as Abu Mohammad, a member of their ranks. A Taliban spokesman told journalists in a text message that the fundamentalist group was not involved with the bombing in any capacity. "The explosion in Jalalabad doesn't have anything to do with us and we condemn it," said spokesman Zabiullah Mujahid of what local authorities are calling the worst suicide attack of 2015. In 2011, the Taliban committed an similarly escalated attack on the same bank branch with seven suicide bombers, killing as many as 38 civilians in the process. "We are responsible for the war in this country, and that is all we can comment and give views on," said Mujahid in a cellphone comment to The New York Times from an undisclosed location. "We haven’t commented on [ISIS] in the past and we will not say anything now." A report by Reuters indicated that the blast from the explosives-packed vest smashed several windows and sent debris flying, leaving the streets shrouded in a smokey haze. Reports of a second explosion were confirmed by police, who said identified the blast as a controlled explosion after authorities discovered a second bomb strapped to a motorbike at the nearby Central Bank of Afghanistan. Initial reports that the suicide attack had been carried out by Taliban agents caused a wave of confusion following the bombing, although U.S. and NATO commander Gen. John Campbell explained to the Senate Armed Services Committee in February that copycats weren't completely unheard of, considering unease in Taliban ranks and the rapid growth of ISIS militant power. "You do have some of the Taliban breaking off and claiming allegiance toward ISIS," he said. "A lot of what we get is through our Afghan partners as they see that probably before we do." An NPR Middle Eastern reporter agreed, explaining in an interview that same month that many smaller terrorist factions have been tacking the ISIS name brand onto their own attacks to gain maximum notoriety. ISIS, in some ways for militants, is the biggest name in town. And so you're seeing militant groups latch on to the name and operate under that name. So here, in the lawless [areas] ... they have an affiliate that's carried out attacks. It's unclear if ISIS is actually organizing those attacks, or the affiliates are doing those attacks in the name of ISIS. Same thing [is happening] in Libya. Authorities in Jalalabad continued to investigate the scene late into the day; as the dust settled, the magnitude of the explosion became gruesomely clear. Shoes and clothing items lay in the streets and the pavement was strewn with debris and blood. Rescue workers pulled children from the rubble. Public health spokesman Najibullah Kamawal confirmed that the bodies of at least 33 dead victims had been taken to local medical centers, and some 125 injured civilians had been brought in for treatment. On Saturday, Pakistan prime minister Nawaz Sharif condemned the attacks and stood firm with his country's neighbors. "Pakistan would be happy to provide any assistance to Afghanistan to successfully fight terrorism," he said in a statement.